From Marshall comes the CODE series of amplifiers, with collaboration from Softube to create MTS modeling to deliver a series that have the authentic modelling of classic and contemporary Marshall tones with professional quality FX. The CODE 50 amp produces 50W of pure power with a selection of controls to adjust your sound to match your needs, and with the ability to connect via Bluetooth, USB and jack to listen to your favorite songs, making this a immensely well designed amp that will match your needs. The Marshall Code 50 is easliy loud enough for small gigs, rehearsals and as it is digital can even be turned down low enough for home use. With 50w pushing a 12" speaker this amplifier has a lot of punch and power coming out of it that make it the perfect amp if you want every kind of Marshall for every kind of situation. 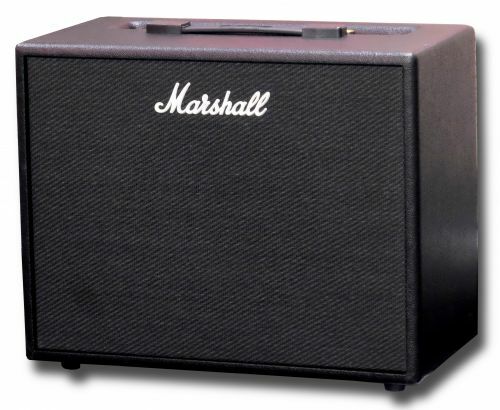 So to give you more control over the sound than Marshall could physically fit on the top of the amp the Code series use an amp for when you really need to dig in deep. With this app you can on the fly change your settings, create presets, manage the amp and even stream music straight to the amp via Bluetooth.